Having a new little one around is making me rethink activities. Her needs are so different than the ‘older’ children I have become used to being with! Have you noticed how little children, babies especially, are often more interested in everyday objects than specially made baby toys? Well, that led me to find out more about ‘discovery baskets’. Also sometimes known as ‘treasure baskets’ these are simply baskets put together for little ones, using a wide range of found objects. 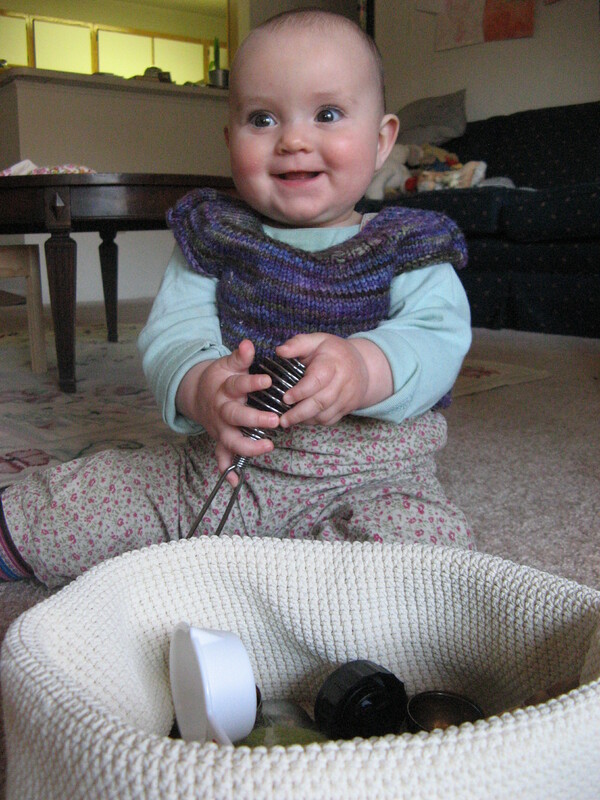 The baby can be offered the basket for short periods a few times a week to keep them special and interesting. Frequently the contents of the basket are changed for variety. There are some great resources online but this is my favorite so far. I have tried a variety of baskets but my favorite is this. No it is not a natural fiber, but it looks like it is and I love that it is flexible. You can fold over the sides to make it more rigid, and improve access for little hands. Oh yes, and it can be thrown in the washing machine!!!!! 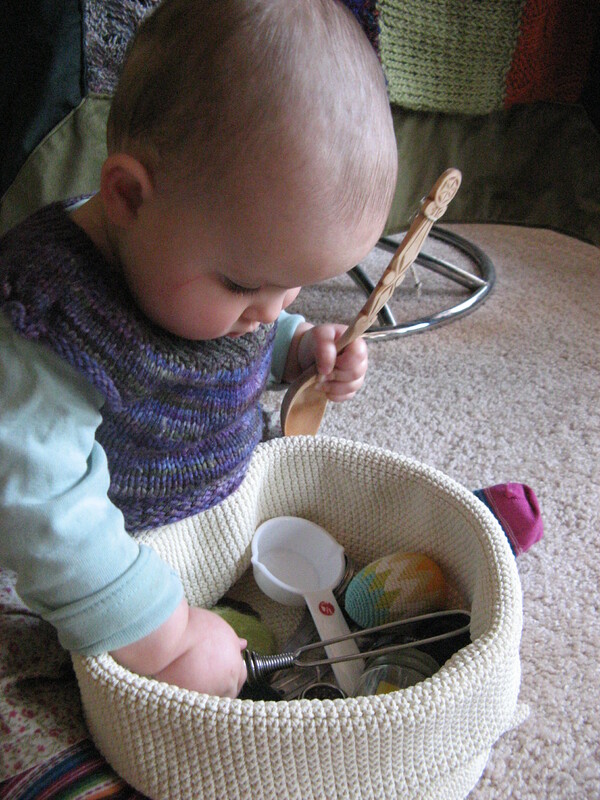 This basket was filled with about twenty items, mostly from the kitchen – measuring cups and spoons, wooden spoon, whisk, jar, tea strainers, and also some felted rocks and toy eggs. It has captivated her for a total of at least an hour so far! * Fabric scraps with different textures, fake fur, leather, cotton, hessian, spandex, lace, balls of yarn …. * objects that make a noise (not necessarily ‘instruments’), jars with beans inside, pringles cans are wonderful with small objects inside and then taped closed! egg timers, shakers, chimes…. Please do remember to be present and watching at all times as things are so often explored by the mouth at this young age. We don’t want anyone to choke! I have recently found your blog and have been thrilled! I have three three year olds (almost four) and a 6 month old baby. I am a resigned public school teacher in CA and have decided to stay home and do a Waldorf Inspired Homeschool for our children. Your blog is full of fabulous ideas and I just wanted to say hi! Our blog is private for the kids sake, but if you would like to be a part of our journey as well, let me know. Thanks so much Saria. I am impressed by your program and would love to know more! It sounds like we are journeying on similar paths. I love how the blog is a way to connect with other educators. Thanks so much for your support.